It's a paradox of the post-Bourdain era: chef memoirs are trendy, but none of the chefs writing them have the freakish combination of cooking and writing talent that made Anthony Bourdain a star. But Jason Sheehan comes damn close, and he gives the genre his own distinctive seasoning. He comes at us from the low end of the culinary universe, with tales of chaos from the kitchens of diners and pubs and pizzerias and Chinese restaurants, told with total honesty and vast verbal energy. 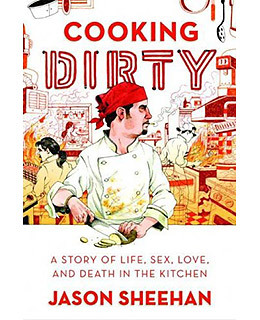 "If you're looking for some four-star confessional," he warns us, "for the cooking secrets of master chefs or some effervescent, champagne-and-twinkle-lights twaddle about bright knives, foie gras and sweaty love among the white jackets, go find another book."